Where in Space Should We Go Next? With the Mars-based Rover having taken one giant roll forward for robots everywhere, we're closer than ever to landing a person there or even beyond. (Or being barred by our robot overlords from their amazing new Mars robo-colony. One or the other.) Today, we want to know where in space we should go next. Is it one of the nearby planets in our solar system that you want to see first, or are the furthest reaches of space where you long to go? Is yours a scientific mission, or simply the best vacation in the universe? Tell us in the comments just where in the galaxy (or beyond) you want to go. Pictures too, please, for vicarious space-traveling purposes. 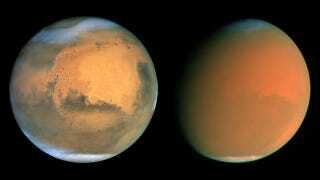 Image: Dust Storms on Mars, NASA / James Bell (Cornell Univ. ), Michael Wolff (Space Science Inst. ), and The Hubble Heritage Team.